It's been more than a month since Trufflepalooza 2010. I've been writing up recipes, but it's taken me this long to get enough perspective to be able to summarize the event. Because it's become more than just a party to me. Trufflepalooza is my chance to go all out. To cook for and with the wonderful friends, food bloggers and otherwise, who enrich my life every day. And to push myself in all dimensions. Can I create an original themed menu with more than a dozen recipes? Can I produce tasty food for 70, get it out of the kitchen and into people's mouths while it's still hot/cold/intact? Can I pull it off without having a heart attack, getting an ulcer, poisoning my guests, or inducing my husband to file for divorce? Once a year, it seems that I can. With a lot of help from my friends and family. Michael, Emery, Weston, Austin, Hilary, Gisele, Adair, Lynn, Suzanne, and everyone else who sliced, diced, stirred, plated, passed - thank you. Without you, I could not. Thanks to all the wonderful food writers who found Trufflepalooza worth mentioning! You are very welcome, Erika. It was a delight to be included in the feting of the truffle! 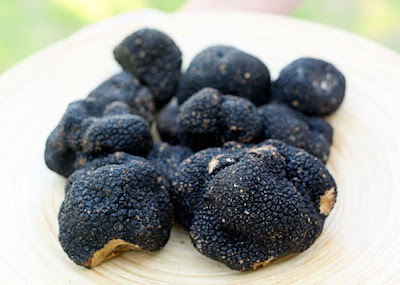 What a wonderful resource for truffle recipes! I'm excited to explore all of these delightful recipes...especially those radish and truffle butter tartines! @Monet - can't remember if I wrote this in the post about the radish tartines, but that is probably the best recipe I've ever created. You will be blown away by the simplicity, and yet the complexity, of the flavors. Do let me know what you think.